built on top of all the music on YouTube that you can’t find anywhere else - personalized and all simply organized in one new app and web player. The hottest videos. We’ll keep you on top of what’s hot! The hottest videos in the world right now are right there, on their own dedicated Hotlist screen. Today in the U.S., it features “Nervous” by Shawn Mendes, in the U.K, it’s “Drippy” by IAMDDB, and in France, it’s "Fais moi la passe" by JUL. 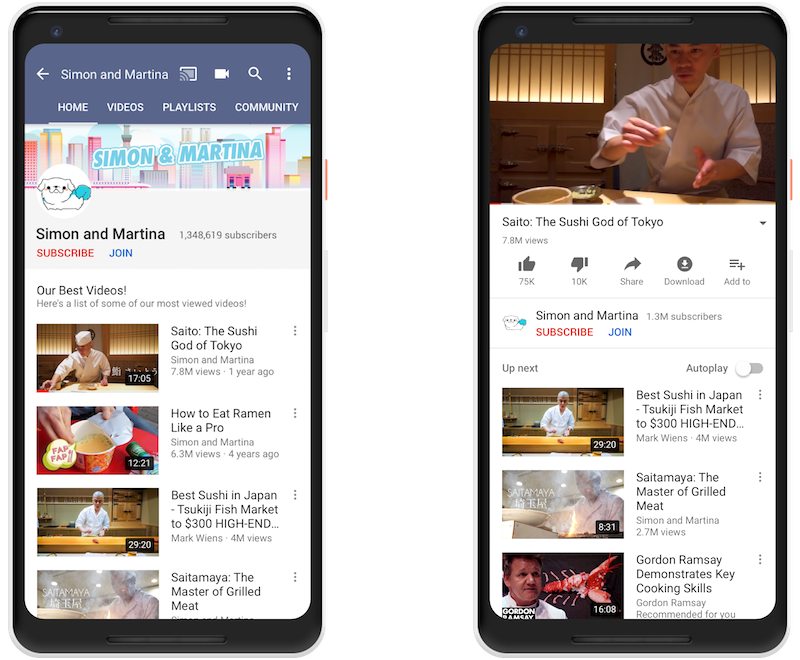 Starting today, YouTube Premium (formerly YouTube Red) will be available in 17 countries, providing members with the benefits of Music Premium, plus ad-free, background, and downloads across all of YouTube. YouTube Premium members also get access to the full slate of YouTube Originals shows and movies including the hit series Cobra Kai, Impulse, F2 Finding Football and The Sidemen Show. For a limited time, get three months free of YouTube Premium here, ($11.99 per month after, $17.99 per month for a Family Plan)*. Current YouTube Red and Google Play Music members (including family plans) in the U.S., Australia, New Zealand, and Mexico will automatically receive access to YouTube Premium at their current price. Google Play Music subscribers in all other countries will automatically receive access to YouTube Music Premium at their current price as it becomes available there. Nothing is changing with Google Play Music - you'll still be able to access all of your purchased music, uploads and playlists in Google Play Music just like always. YouTube Music is a new music streaming service built on top of all the music on YouTube that you can’t find anywhere else - personalized and all simply organized in one new app and web player. to ballet, home videos to fine art, electropop to piano, Olympic ice skating to skateboarding, creative self-expression has proven to have the power to change the world. All of these creators use their art and expression to imagine a better future, and in doing so, help create one. Keep your eye out for even more stories on our YouTube Spotlight Channel, Twitter, and Instagram. What are you #ProudToCreate? Our LGBTQ community has an extraordinary legacy of turning adversity into creativity and self expression. On YouTube, we’ve seen LGBTQ creators use their voices to share their stories, their art, their music, and their passions to help shift culture, increase visibility, and create change. We are so proud of the contributions you have made to the platform; you've helped make YouTube what it is today. Over the past few days, we’ve heard many questions around monetization and how ads are served against videos by LGBTQ creators. We know this has been both confusing and painful, and want you to know that we hear you. YouTube is an open platform and we support the free expression of creators with a wide range of views. But we don’t allow paid advertising that disparages people based on who they are and we remove ads that violate this basic principle. We also want to tell the world how proud we are of LGBTQ creators and our broader community. We hope you'll join us in celebrating everyone who’s #ProudToCreate a better future with their imagination, creativity, talent, and truth. From vogue to ballet, home videos to fine art, electropop to piano, Olympic ice skating to skateboarding, creative self-expression has proven to have the power to change the world. When it comes to football-related content on YouTube, match recaps, game highlights and trick shots proved popular. Over the past two years, the amount of time people spent watching match recaps on YouTube has more than doubled, and since the last FIFA World Cup, watch time for soccer game highlights has grown by 9x, while watch time for soccer-related trick shots has gone up by 50 percent in the last year. Miss a game? Can’t get enough of the action? On YouTube globally, you can catch up on your favorite 2018 FIFA World Cup moments with select video highlights from official FIFA broadcasters in more than 80 countries around the world, including from Telemundo in the U.S., the BBC in the U.K., ARD Sportschau in Germany, NHK in Japan, Kwese in Nigeria and across Africa, Televisa in Mexico, Latina Televisión in Peru, and more. In the U.S., you’ll be able to watch all games live in markets where YouTube TV is available, with the additional option of using the YouTube TV cloud DVR feature to record matches you can’t catch in the moment.